Quesada also known as San Carlos because it’s the capital of the San Carlos Canton is a true city in every sense of the word. There’s booming business, frequent public transportation, and easy access to shopping, professional services, and entertainment. Yet this commercial center in the Northern Lowland Plains is surrounded by lovely pastoral countryside. Thus, residents in Quesada have the best of both worlds; they can benefit from all of the conveniences of a city and still take in peaceful views of the lush green fields. Best of all, residents can enjoy the natural hot springs located on Quesada’s outskirts of town. Many expats settle in Quesada, and there is actually an expat group called “InterNations” that has monthly meetings here. 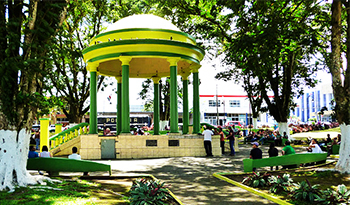 Quesada is typically an upper-middle class city with some very upscale parts; properties can reach well up to two million dollars for a private estate with waterfalls and personal hot springs. Typical real estate properties in Quesada include 0ne to three bedrooms, and are in the form of villas, wooden cabins, expansive single-floor dwellings, hillside homes, chalets with porches and balconies, or brightly colored tropical homes. One could invest in a larger home on 5 acres, with views of volcanoes, plains, or gently rolling hills, for approximately $250,000. The main roads have been recently repaved, bringing in even more tourists, so vacation rentals abound. There are villas and hotels starting at just $40 a night.